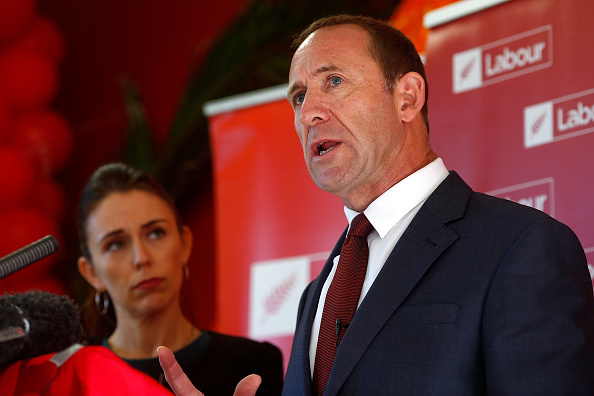 Andrew Little today quit as Labour leader, clearing the way for fomer deputy Jacinda Ardern to take over. Little made his announcement after a brief meeting this morning, saying that the party would be "better served" by a new leader. Editorial: Little left to offer? "I have just confirmed to the Labour caucus that I will step aside as leader of the Labour Party," he told reporters at Parliament this morning. "There is no question that the poll results that came out last week ... were disturbing and very, very disappointing. "In the end, as leader, you have to take responsibility. And I have, and I do." Little said he remained "utterly determined" to get Labour into power in the September election. He said he would stay on as an MP at least until the election. "But it became pretty clear that the story around those polls was building a narrative day after day that meant we have not been able to get our messages about the things that actually matter. "I take responsibility for that and it is my judgement that the people and the party who were are campaigning for will be better served by a new leader who can bring a fresh face and a fresh voice to this vital campaign." Little said he expected Ardern to be nominated as leader, and said "she will have my 100 per cent backing". He had not considered whether he would be her deputy. His announcement came just an hour after he said he would not resign and did not expect to be challenged for the job. Little denied he had a last minute change of heart, saying he had said "nothing about stepping up, stepping down, going around". Asked whether he had lost the confidence of his caucus, he said it had been very supportive and that it was ultimately his choice to stand down. Little said it had been a privilege to lead Labour, and he "only had good memories" of his time in charge. "Please do not ruin them," he told reporters. It follows two days of turmoil after a string of bad polls and Little's admission he had asked senior colleagues if he should step down. Today I have announced that I will step down as leader of the Labour Party. I’m proud to have been leader of the Labour Party, and have given this position my absolute and unwavering dedication, just as I have done so for more than 25 years in the Labour movement. While obviously this is a sad decision, I have been privileged to have led a united, talented team of Labour MPs, proud to have progressed the values and issues that New Zealanders care about and proud to stand with working New Zealanders. I remain committed to the Labour cause of putting people first, lifting the rights of working New Zealanders and strengthening Kiwi families. The Labour team of MPs and staff have worked incredibly hard during my leadership, however recent poll results have been disappointing. As leader, I must take responsibility for these results. I do take responsibility and believe that Labour must have an opportunity to perform better under new leadership through to the election. I am determined to make sure that Labour fights this campaign with the greatest of resolve, because far too much is at stake for far too many New Zealanders. New Zealand needs a Labour-led Government, and in order to achieve this Labour must fight without questions over its leadership. The campaign is on a good footing, Labour’s caucus is united and the party is healthy. My colleagues in the Labour Party caucus will elect a new leadership team this morning. I wish my successor all the very best in their new role, and offer my wholehearted support to them.